Prior to traveling to Quito, Ecuador in February, 2016, I did a lot of research, looking for buildings that might make good photo opportunities. 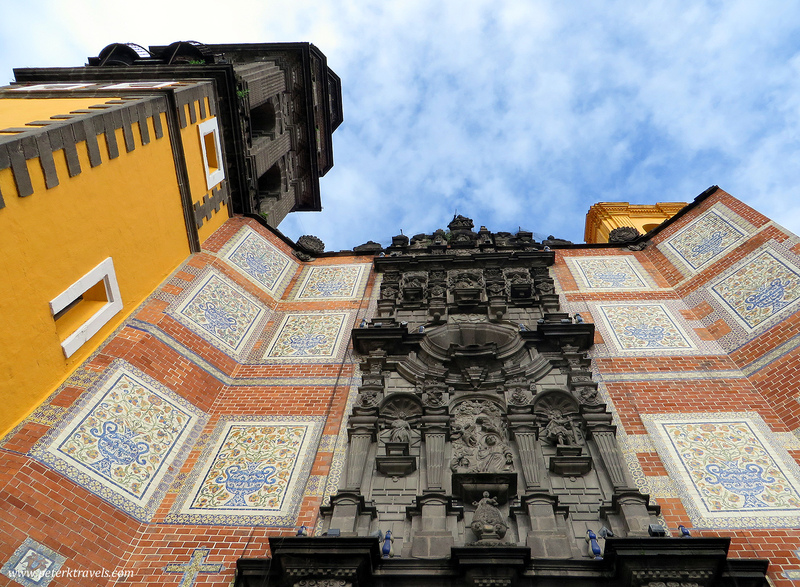 A few were obvious — the Basilica Voto Nacional, for one. 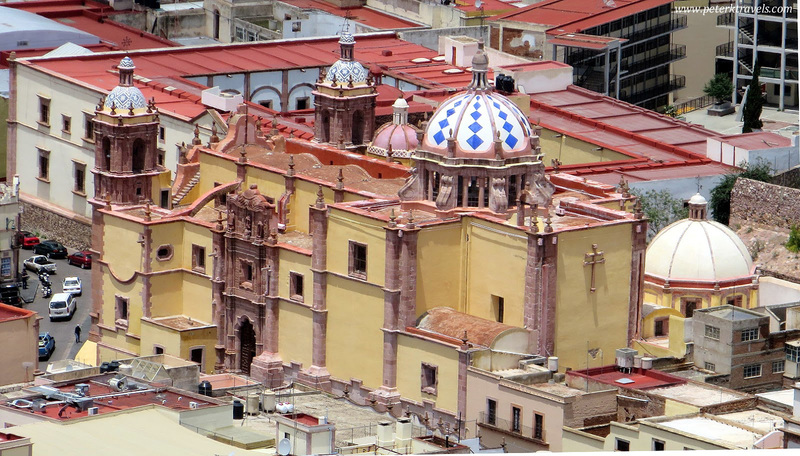 In addition, I found several photos of the Iglesia San Francisco that piqued my interest. 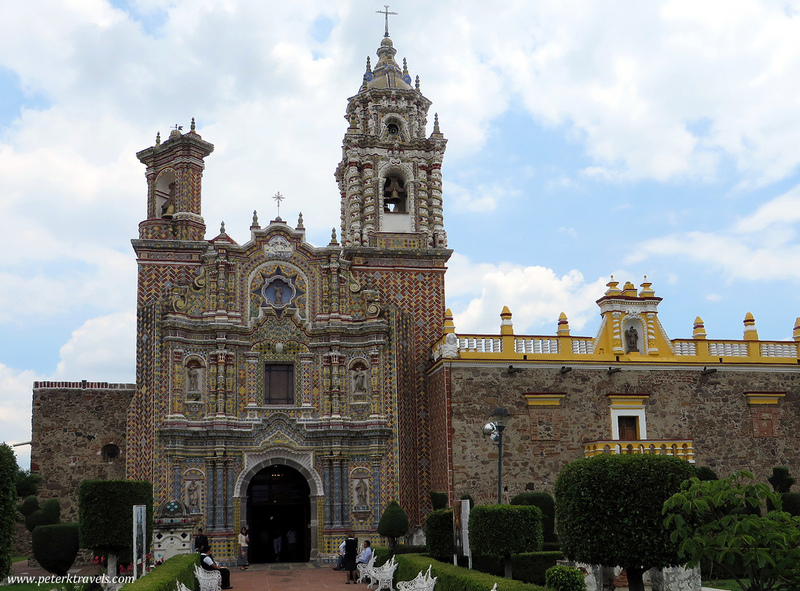 A long, low white church with a beautiful plaza in front,. Colorful homes climbing up the hills behind it. From thousands of miles away, it looked perfect. These days when I plan a photo opportunity, I usually try to find a place with some height. I spent a bunch of time on Google Street view looking around the area. I realized a small hotel was on a corner of the plaza — Hotel Benalcazar. I looked at photos of it online. I could tell they had a terrace. The rooms at the hotel, however, did not look so great. I decided I didn’t really want to stay there, instead, I booked a cheap room just to get access to the terrace. I probably could have talked my way in, but wanting access pre-dawn, or post-sunset, that could be difficult. It was worth a few bucks to guarantee access. When I arrived in Quito, I went to check out my great photo opportunity, and immediately realized I had a problem. 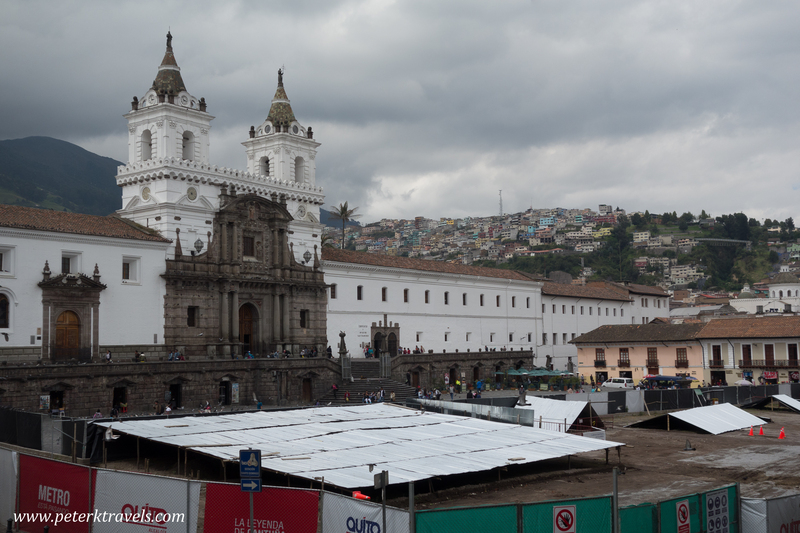 The beautiful, sweeping plaza in front of the church had been completely torn up. Apparently, they were putting in a subway. I checked into my cheap room at the Hotel. The hotel didn’t have open access to the lobby or terrace, so having a room turned out to be a good thing. The view out of the room wasn’t good, but the rooftop terrace had a decent shot. I figured with enough cropping, I could remove the plaza and still have something to show for the effort. I returned later that day. As the sun started to go down, I got set up. My goal was to get a nice blue-hour photo, with the church lights on, and the homes behind lit up as well. It was going to great! As the sun went down, half the lights on the church were turned on. OK, so we just need someone to flip the switch on the other half. I waited, hoping the rest would be turned on. They never were. So, I took my photos anyway. It was still a nice photo, I guess. No plaza. Only half the church lights. Sigh. I returned the following morning. The light wasn’t great before dawn, but I did get a nice early morning shot. I guess this just goes to show that no matter how hard you plan, travel can still throw you off. I think I’m going to teach myself enough Photoshop to turn those lights on. 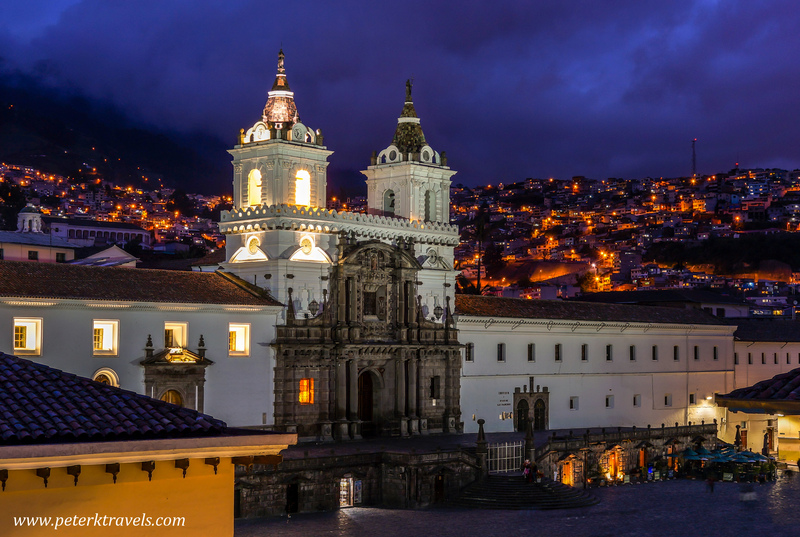 3 Responses to "Getting the Shot: Iglesia San Francisco, Quito"
Beautiful shots, it’s really too bad about the other half of the lights I’m the blue hour photo. The early morning one is great too. 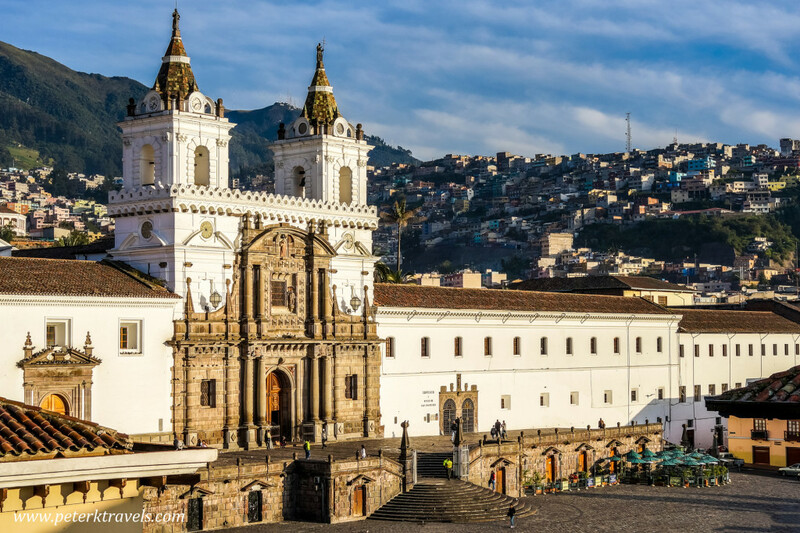 Looks like I may need to visit Quito someday, looks like a beautiful city! Hah, I know about it. We were in Taxco, Mexico recently having a sunset margarita on the terrace opposite the cathedral, and waiting and waiting for the lights to come on. Finally I asked the waiter and he sold no, not until Friday or Saturday – budget cuts! At least I can look at your photos Peter! And yes Quito is great, but high altitude. We saw a marathon when we were there, which exhausted me just thinking of it. Wow, that’s a shame about Taxco — that church is fantastic all lit up!